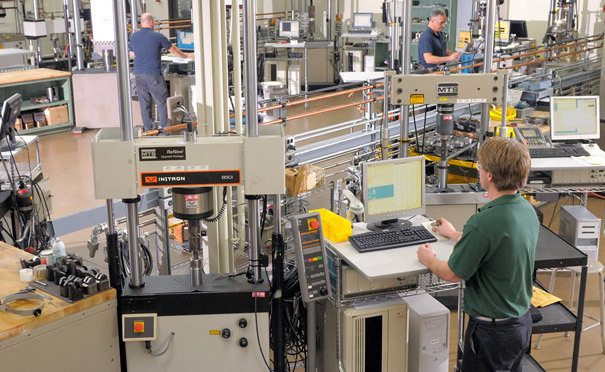 A full range of mechanical testing services is available, including tension, compression, fatigue, fracture toughness, impact and stress, and creep rupture. All are performed at temperatures from -320°F to +2200°F. There are also complete in-house facilities for lab-quality preparatory thermal treatment of specimens and hardenability studies. Stress rupture test equipment is autoloaded whenever the test is ready, day or night. Digital tensile testing and software-controlled tests for fracture toughness and crack growth, once directed manually, are performed in as little as one-quarter the time. Stress and creep rupture testing is done on frames which are independently mounted and balanced to enhance alignment. Each furnace has three independently controlled temperature zones, which are continuously adjusted during testing. Computer controlled fatigue test systems provide up to 110 kip in strain or load control modes at elevated or cryogenic temperatures. Automated temperature control software replaces manually adjusted analog controllers to manage mechanical tests for heat treating and stress and creep rupture. All test parameters, loading and data acquisition are computer-governed for accuracy and long-term consistency without technician intervention or monitoring. Quick ramp-ups to test temperatures mean faster testing, faster results. 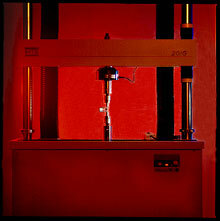 MTS software provides fully computerized control of tensile and compression tests at both ambient and elevated temperatures. This software goes beyond test control to include a complete data acquisition and analysis package. It also provides a real-time modulus of elasticity display during tests for technician verification that testing is proceeding correctly. Load cell-controlled, top-loading, closed-loop machines provide outstanding repeatability and accuracy of depth and force measurement and control. Top-loading feature eliminates elevating screw and deflection of standard hardness testers. Fully automated software speeds up the pre-crack portion of fracture mechanics testing. 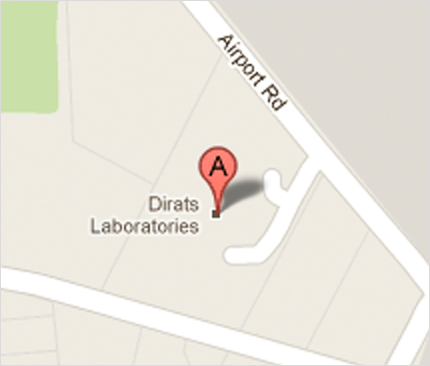 It increases Dirats Laboratories' capacity and throughput speed, delivering results to clients more quickly. Computerized control helps assure valid testing and accurate results.